Have you ever been involved in a heated debate about the best way to fix a ball mark? I know I have! In general, superintendents would prefer that golfers use any method as opposed to doing nothing, but there is a method endorsed by the golf community that is considered the official way. 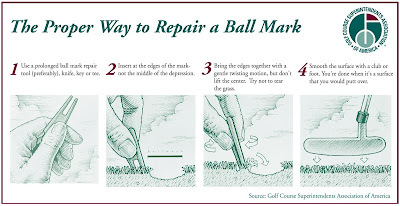 When I first started golfing in grade school, I assumed the best way to fix a ball mark was to use a tool to pry up the middle of the indentation. This seems logical but it can result in torn roots and more recovery time. The best way is the "twist" method endorsed by the Golf Course Superintendents Association (GCSAA). Here is the secret: Your goal is to stretch the undamaged surface back into the depression, not to lift the depression by prying. The putting surface is actually a fairly elastic thing. Ball impact pushes the surface out to form the ridges around the depression, so you can fix it by stretching the surface back in. In the process, the indentation or depression should flatten out. I think many people are reluctant to try this method because it is difficult to visualize. 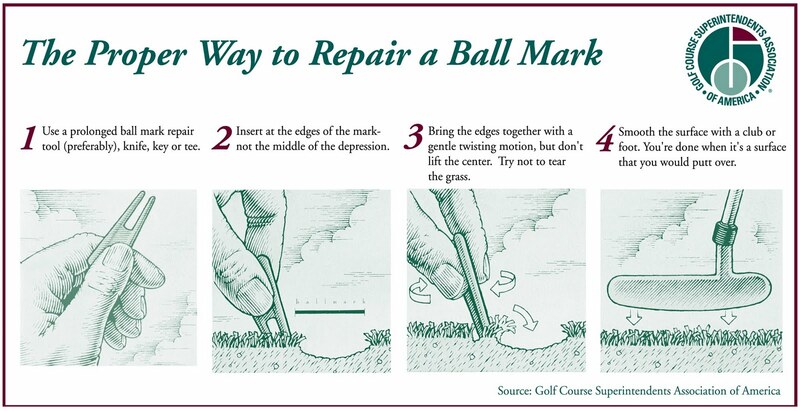 As a result, many golfers may not attempt to fix their ball marks because they are afraid of doing it the "wrong" way. I am going to go out on a limb and say "If you have a method that works for you and results in a puttable surface, go for it!" If you don't, try this method. You may be suprised by how easy it is. After heavy rains, golf courses often have to restrict cart traffic. There are generally two types of restrictions: no carts available or cart path only. We do this to limit damage to the course and ensure playability for the season. For the sake of your golf course, remember that golf car traffic can cause damage to the golf course that is both unsightly and expensive to repair. Tire ruts in soft, wet areas can take weeks to heal. Compaction caused by heavy traffic can ruin the playing surface. As a result, most courses have a standard golf car policy and sometimes employ temporary restrictions due to weather, construction or other factors. After the heavy rains Thursday, we had to restrict carts to paths only for two days. During that time, we had some golfers stray from the paths with visible results. As a superintendent, I really dislike having to restrict cart usage to the paths but you can see why it is important. Imagine if 10 people decided to go off the path instead of the 2 or 3 that probably did. If the areas you can see in the pictures were driven over multiple times, these areas would be damaged for weeks or even months. To summarize, cart path restrictions are put in place by the people who really know the condition of the golf course and they are for every one's benefit. Just like frost delays, no one likes them -- but they are necessary for the health of the course. After a relatively warm and dry April, the first half of May has been a little cool and wet. Many golf courses flooded last Thursday, May 13th. The average rainfall for May 1-13 is 1.5 inches and we have seen around 4.5 inches at Sugar Creek (WGN). Areas north of us have seen even more. At Sugar Creek, we were fairly lucky. The water rose on Thursday morning after the thunderstorms but receded by the end of the day. With some modifications to our normal mowing schedule due to wet conditions, we were able to have the course in good shape on Friday for an outing. One of the mosts time consuming jobs after a thunderstorm is fixing sandtraps. After a good downpour, the sand from the upper parts of the traps wash down and the traps are filled with water. Drains in the sandtraps will remove the water eventually but not immediately. To make the traps playable quickly, they need to be pumped, resculpted, and raked. Excessive rain also interupts our mowing schedule temporarily leading to some catch-up work when it dries out. However, adjusting the mowing schedule is not nearly as time-consuming as sand trap restoration. There is a frost advisory for this Sunday morning. I was hoping we had already seen the last frost, but you never can tell. I usually check National Weather Service Chicago at http://www.crh.noaa.gov/lot/ for frost and severe weather information. For information on golf and frost delays, check out Frost Delays on this blog. CDT /9 AM EDT/ SUNDAY. One of the often overlooked responsibilities of a golf course superintendent is plumbing -- not residential plumbing, but high pressure irrigation plumbing. Over the last two weeks, we fixed 3 leaks on the golf course and replaced our main 6" suction pipe in the pump house. Click on the picture on the left to see more pictures from this project. Kevin Goss is the Superintendent at Sugar Creek Golf Course in Villa Park, IL. Sugar Creek is a fun and challenging 9-hole course and driving range located in the western suburbs of Chicago.